An exciting new collaboration between Somm Recordings and the Tippett Quartet begins with striking performances of early and late string quartets by Mendelssohn. Fiercely imbued with the spirit of Beethoven, Mendelssohn’s Opp. 12, 13 and 80 quartets brim and boil with an innovation, dynamism, emotional sincerity and technical flair some would deny the composer. These deeply felt performances from the Tippett Quartet present Mendelssohn in a new light and challenge Hans von Bülow’s notorious observation that he “began as a genius and ended as a talent”. 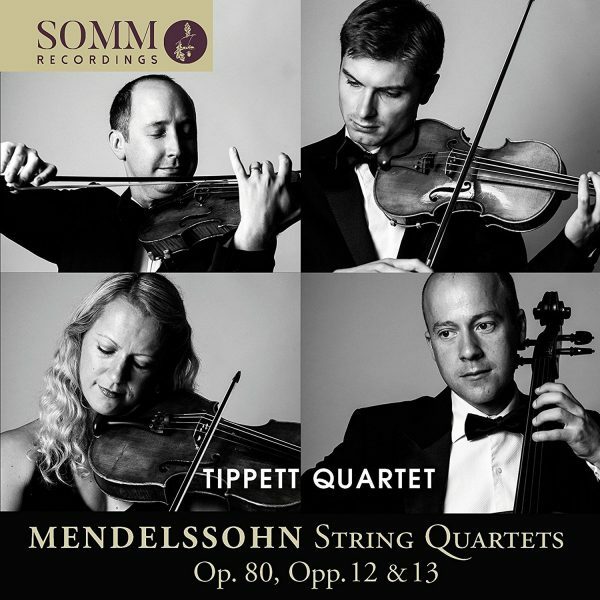 For the Tippett Quartet, these are works that “banish past notions that Mendelssohn’s music is in any way lacking in emotional depth or profundity. We celebrate his innovation, invention and powerful spirit.” All three quartets – Op. 13, composed when Mendelssohn was just 18-years-old, and Op. 80, his last major work, completed two months before his death at 38 – speak movingly of loss. Op. 12 laments the passing of Beethoven, Op. 13 (directly modelled on Beethoven’s Op. 132) regrets unrequited love, Op. 80 an inconsolable response to the death of Mendelssohn’s sister, Fanny. The earlier works, the Tippett Quartet says, “command an astounding expressive power and technical prowess with all the exuberance and intensity of a young man searching for the sublime and the profound”. Mendelssohn’s last significant musical utterance, the valedictory Op. 80, “turns his sense of loss, grief and, most of all, anger into a truly sublime work of art”. “When we were recording them,” says the Tippett Quartet, “it felt like we were playing brand new pieces by a living composer, not works that carry, and have become burdened by, the weight of tradition”. These poignant, powerful, emotionally raw, musically rich performances make persuasive claim for music of passion, poetry and profundity and offer fresh insights into Mendelssohn as he was meant to be played.